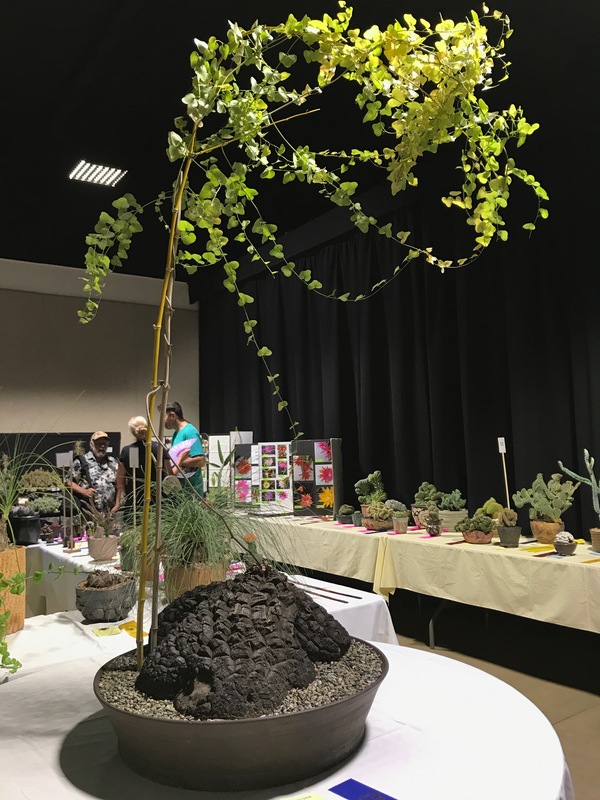 This weekend was the 33rd Intercity Cactus Show and Sale at the LA Arboretum in Arcadia and it was packed – with people, plants and classes. The day was steaming hot but it didn’t deter the crowds crazy for cool plants. The current fascination for cactus and succulents has helped this show and sale grow bigger than ever. This was one of our Desert Horticultural Society of the Coachella Valley’s summer field trips but we didn’t really escape the heat. The morning crush for plant deals was overwhelming so I sought refuge in the show. What an amazing array of entries and some plants just stopped you in their tracks because of their size, interest, bloom or armature. 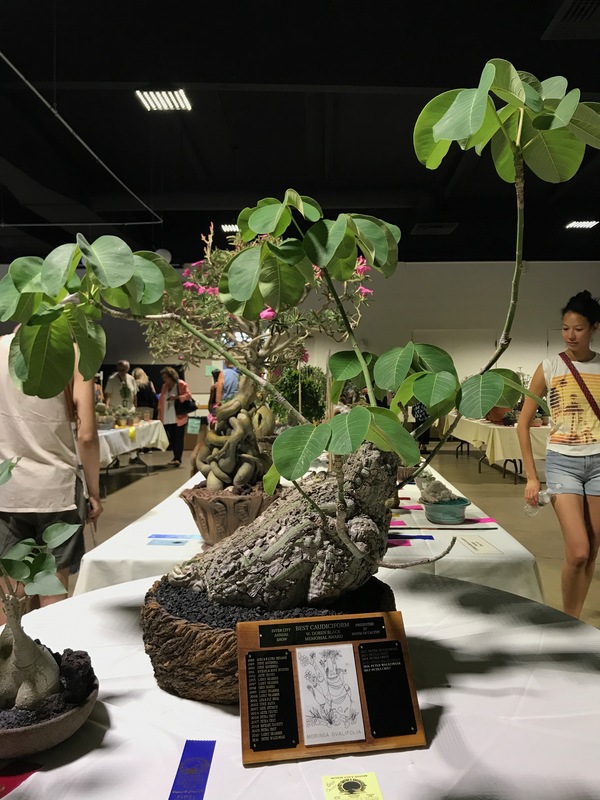 Plants with caudexes (swollen trunks that provide water storage for the plant) really stood out this year, some were shaped as bonsai with lots of foliage, other’s highlighted the caudex with only one vegetative stem and some had beautiful blooms. You could spend hours wandering the show and taking pictures (like I did), or stock up on lots plants (I bought a few), or attend some of the free lectures (which were great) and of course wander around the LA Arboretum (I ran out of time). Or you could stay till the very end of the show, pick up a few plants with no line, go to a great Aeonium workshop by Sandy Chase and to a propagation workshop by Joe Stead of Orange Coast College and pot up a Beaucarnea recurvata (Ponytail Palm) to take home with you. What a great, but melty, day!! The Inter-City Cactus is a program of the San Gabriel Cactus and Succulent Society, the Los Angeles Cactus and Succulent Society and the Long Beach Cactus Club. Mike, this Pseudobombax ellipticum (syn Bombax ellipticum) is for you. Photos © Tracy Merrigan 2018.